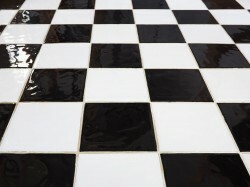 Tile cleaning can be a difficult and time-consuming process if you are not a professional, which is why you can trust the experts at Carpet Solutions to get your tile and grout looking brand new. A thorough inspection is made BEFORE starting. Damaged tiles or excessive grout deterioration may impact the ability to perform this process safely. Furniture must be removed and the floor is swept or vacuumed. Heavy stains in the grout are pre-treated, and then we scrub the grout lines and tile. Next we rinse the floor and remove all moisture. A clear grout sealer is used to help keep it from absorbing liquids readily and preserve the fresh, clean appearance until the next cleaning. Call us at 208-339-4080 or fill out our online contact form . Carpet Solutions is your solution for Carpet Cleaning, Tile & Grout Cleaning, Upholstery Cleaning, Air Duct Cleaning, and Concrete Cleaning in Pocatello, Idaho Falls, Blackfoot, American Falls, Burley, Shelley, and Aberdeen. Travis has always been great to work with. I trust his work. Carpet Solutions is the way to go for carpet cleaning. The best job for the money. I would recommend them. Good work with a good price. I gave them a $20.00 tip…. They are the best in Pocatello. They do at amazing job for a reasonable price. I would not hesitate referring them to my friends and family. Best carpet cleaner in town! Great customer service and they do an amazing job! Travis and his crew are the best! Very satisfied with my service from Carpet Solutions. He has helped several times with untimely spills. I would recommend him. His prices and service are exceptionally good. Carpet Solutions was fantastic! They cleaned my business very quickly and carpet looks great I’m surprised that it was such a good price!! These guys are awesome. They were quick to get to us, very fair priced, and did an excellent job. I would recommend them to anyone. Travis makes you a priority and does an amazing job! I’d never have any one else come into my home and clean my carpet. These guys are the absolute best. Fill out our form for a FREE Quote on your next carpet cleaning! If you would like any additional information regarding our services, please fill out the form below and we will respond to your request promptly. You can also reach us via telephone at 208-339-4080 or email at carpetsolutions.idaho@gmail.com. Please note, we keep the information you send confidential and it will be utilized only to respond to your request. 835 W Cedar St Suite C, Pocatello, ID 83201. 208-339-4080.